But why? Orris root powder is the dried powdered root of the flower iris pallida (sweet iris), and is used in potpourri making to prolong the fragrance. 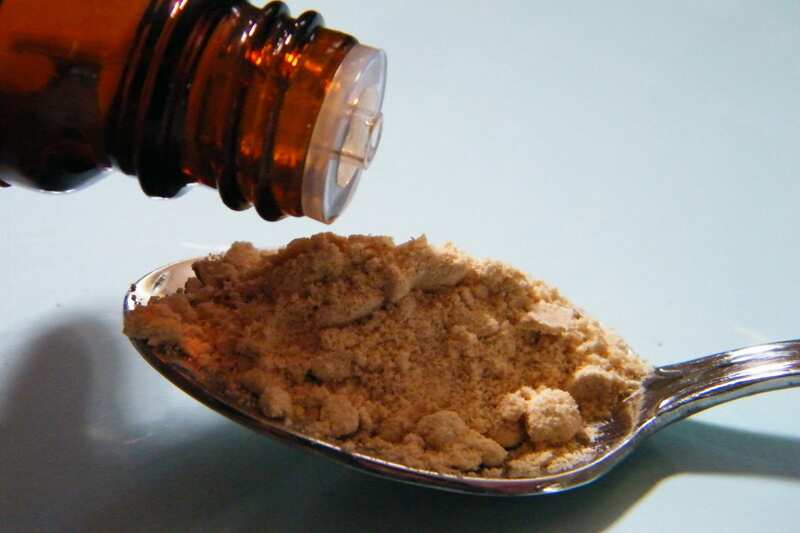 Dripping essential oil onto orris root powder to fix the fragrance of potpourri. The list goes on, but many of these items will be available in your kitchen or garden or aromatherapy box, without the need for a shopping trip. If you would like to use a traditional method, choose a fixative from the list above that is not in powder form. If you are open to modern methods, try making potpourri using modern home fragrance oils. Just use fragrance oil instead of essential oil in your chosen recipe and omit the fixative and waiting time. Just leave in a sealed container for a couple of hours to permeate before displaying. Modern fragrance oils are very realistic, but you may lose any aromatherapy effects of the potpourri. Display your dried petals and herbs in a bowl and drip on a little essential oil whenever you feel like it. This way, you keep any aromatherapy benefits of the essential oils, but with none of the waiting time or dust. However, the fragrance achieved will not be as complex as the one obtained using the traditional method. Adding home fragrance oil to dried flowers to make potpourri the modern way. See how I made the bowl of potpourri in the image above. Well if you still insist on buying orris root powder, we do sell it at daisyshop! Hi, i didnt realise I could use other things, thanks. I am making some embroidered lavender sachets for my friends underwear drawers. Do I need to put orris powder in with the lavender buds or is there no beed? I thought it stopped it going off? Thanks for commenting, I appreciate it. You don’t need to add orris root powder if you’re using lavender buds. If the fragrance fades, just tell your friend to give the bags a sharp squeeze to release more of the natural essential oils from the lavender. I’ve had bags for years that I’ve kept going this way. Hi, Yes it sounds like it’s worth a try. I’ve never tried bark but it’s possible – it doesn’t hurt to experiment! Just see how absorbent it looks when you drop the oil on, and how quickly it releases it again. Take care not to try it with anything poisonous! Ruth. I would like to purchase from your company at a wholesale price so that I can make my own potpourri to sell in my shop. I am not required to have a tax ID number or business license where I sale. I have a booth in an antique store and therefore all of the taxes etc are paid by the owner. Is there any way that I can purchase wholesale without the tax ID number. Hello Linda, Yes you are most welcome to purchase from our shop at daisyshop.co.uk! We don’t have a separate wholesale list, but the larger the pack size the better the price. Tax ID is not required at the checkout. Thanks, Ruth. Last Xmas I made my own room fragrance by putting slices of lemon, some cinnamon, cloves, bay leaves and some vanilla flavouring in a pan of water, with a bit of vodka added, and letting it gently simmer away for a few hours. The smell was gorgeous and filled the whole house, but didn’t last long after the pan was switched off. The mixture lasted a while, just needing to be kept topped up with water. This year, I would like to do this again, but I want to improve on it. Is there anything that I can add to it that will help the fragrance to last? I want to be able to use the liquid in three ways – one is to put the mix into a jar, which when the lid is removed will give off a noticeable aroma. The jar will look decorative and will also be able to be used to fragrance a room. ; – one is to be able to use a cupful of the liquid in an oil burner or something similar; and finally I would like to be able to use the liquid in a spray bottle, to spray the fragrance in a room. Is there anything that you can suggest? Hello Ruth. Nice post, but orris root (kibbled and powdered)is prepared from the roots of iris germanica, i pallida and i florentina, none of which are sweet flag. Sweet flag(or bitter root)is acorus calamus which is not an iris at all, though very useful. I grow and use both. Thanks Roger – I have now had a look into it and it’s a bit of a minefield. In the UK the word “sweet” is used for both Acorus calamus and Iris pallida. I was referring to Iris pallida, so have removed the word “flag” from the post to avoid confusion. Thanks for your help! Marjoram dried and frankincense essential oil. What proportions do you suggest.? Have you ever tried pulling a vacuum on some wood shavings, sweetgum balls, Lilac buds, etc. using essential oils and carrier oils? Have a small vacuum and thinking of trying it. Hi Ruth. I am make potpourri for the 1st time and it is dried french lavender rosemary and dianthus for bright colors. Do i need to add orris root powder in the mix??? Or could i substitute on the orris root powder. Yes i have got wild lavender oil to go through the mix. Thanks. In making Potpourri for the first time really all I have are white & pink roses I’m drying them. I can go get some fresh rosemary from a neighbor’s yard & I have ground cinnamon. Would that work well? I can’t find orris root in my area and am unsure about the other scents in your list. First, I’m not familiar with half of them and second, would like a neutral smelling fixative. I want to make a potpourri gift for a friend (using her wedding flowers which I dried and kept). So I want a sweet rose scent in the final product. I have the roses and the essential oil, but want a neutral fixative. The health shop in our area had no idea what orris root is, but the lady recommended baking soda. In your opinion would that work? Thanks for the quick reply I’ll do it that way, thanks. Hi in India I do not get orris root powder… can licorice powder be used as substitute..
Hello Somaya, Most ground spices can be used – just choose one that compliments the fragrance you are trying to create. I’m afraid I’ve never tried licorice powder though! I’d recommend trying it with a small amount and see how you get on. What about orris root powder for pomanders? Can I use something else or is orris root better? Hi Teresa, You can leave out the orris root if you like. A lot of recipes use ground cinnamon which does the same job and smells fab!